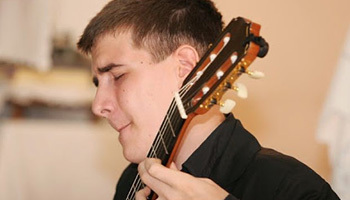 Belmin Okanovic (1997, Tuzla, B&H) started to play classical guitar with age of seven in his hometown, where he finished Elementary and High music school under the direction of Prof. Predrag Stankovic. He had opportunity to participate in masterclasses held by Marcin Dylla, Marco Tmayo, Denis Azabagic, Dejan Ivanovic , Thomas Offerman, Srdjan Tosic, Sanel Redzic and many others. In 2013, he got award from Ministry of Federation BiH as best student of all High music schools in Bosnia and Herzegovina, whic makes him very proud.